James Garner as Bret Maverick, my favorite western character ever. I don’t have a television set–gave it up when I separated from my wife Cathy (now divorced) in 2011, and without a tv set, there’s no reason to get cable tv. When I want to watch some television to relax, I put a dvd into the computer. A couple of weeks ago I was browsing at my local library, and I saw a fat box called Maverick, the first season. With fond memories of my childhood dancing through my head, I checked it out, and took it home. . . .
You know what? The show is just as good, or maybe even better than I remember. Maverick made his first appearance on television in September of 1957. I had forgotten exactly when I was watching that show, but it had to be between 1957 and 1960, because Garner quit after the third season. Back in those days tv was black and white only. I don’t think my family had color until the seventies. Although color shots of Garner as Maverick exist, I’m not putting them in. I want you to get the same feeling I got when watching this series. Maverick is a good guy. He only cheats the cheaters. He knows all the poker tricks but doesn’t use them against the people he plays with. He likes high stakes games, and usually winds up winning them. He goes out of his way to shut crooks down in various episodes. He’s good with a gun, but he’s not a gunslinger. He’s rugged enough, but he likes to dress up as a dandy. The picture above shows him in his typical working outfit–lace shirt, bow tie, and all. He’s funny and self deprecating. And he hands out good advice from time to time, mostly as quotes from his “pappy”. As Pappy always said, “Never draw to an inside straight, or hold a kicker.” I remembered the inside straight part, but forgot about not holding a kicker. Who knows how many poker hands that has cost me over the years? In episode number 8, Bret Maverick gets a brother named Bart. Bart is also a gambler, and is a lot like Bret, not quite as amiable, but as played by Jack Kelly, a guy with more “cool” than Bret. And Bret has a lot of cool so that’s hard to do. Bret Maverick is a joker and kind of a funny guy. I may have subconsciously modeled my own character after his when I was younger. Bart’s humor is dryer and wryer. Bart is more sophisticated and comes across as smarter than Bret, though neither of them is at all stupid. Do Bret and Bart really look like brothers? There are 28 episodes in the first season of Maverick. I’ve watched 10 or 12 of them, and am enjoying them greatly. I’m not giving the dvd set back to the library until I finish with it. The original Maverick show lasted for 5 years. It made various comebacks with the last tv series filmed in 1981-82 which shows Bret settling down in an Arizona town with his own saloon. I remember watching that. The show really hadn’t lost any of its charm even 25 years after its first appearance. In 1994 Mel Gibson starred as Bret Maverick in a very funny movie. I’ve watched it twice, and would watch it again any time it crossed my path. That was kind of a hoot because it had a cameo appearance in it for James Garner as Maverick’s pappy Beau. By that time Garner was much too old to play Bret, but Mel Gibson did a good job with it. 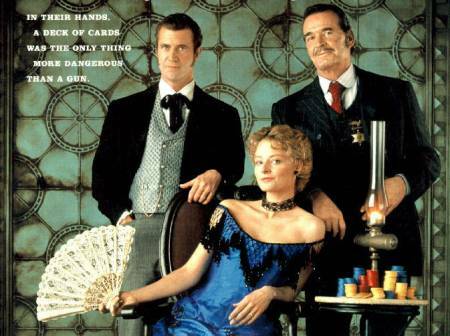 High stakes poker in the old west–the Maverick movie got everything right including an encore performance for James Garner as the Maverick pappy. There were some other Mavericks in the family. 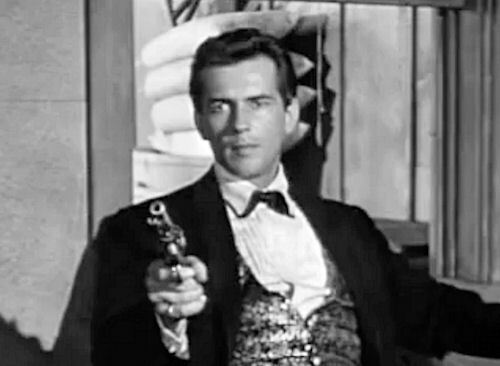 When Garner left the role in 1960, Warner Brothers brought in Roger Moore to play cousin Beau Maverick. 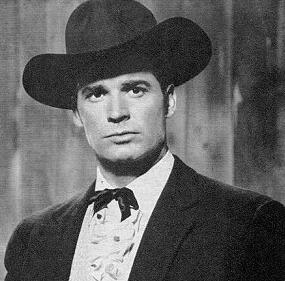 Robert Colbert, who looks a great deal like James Garner, also made a few episodes as cousin Brent Maverick in 1961. He wasn’t popular and didn’t last long. I don’t think that’s a knock on Colbert’s talent–just that the whole Maverick schtick was getting old by then. When I was a kid, I never wondered about the Maverick series. I just took it episode by episode and enjoyed it, looking forward to the next week’s show. Looking back at it as an adult, a few things nag at me. The adventures that the Mavericks get into vary widely, and are set all over the map. How could one man move around so much, get shot so often (Yes, Bret gets shot more than once in the series, but it never kills him. ), get knocked out so often without suffering permanent brain damage, and get stuck in jail so often without being on the lookout-for-this-guy list of every lawman west of the Mississippi? I just watched one called “The Wreckers” that is an adaptation of a sea story by Robert Louis Stevenson. If there was ever an unlikely setup for riverboat gamblers like the Maverick brothers Bret and Bart, it’s the middle of the Pacific Ocean in a story about personal redemption. Now that I’m old and jaded, I wonder about one other thing. All the Mavericks have the initials B.M. Did the script writers back in the fifties know what BM stands for? Were they having some kind of joke with us? I credit a big part of my interest in knowing how to play poker to the Maverick tv series when I was a kid. I’m gonna remember that “never hold a kicker” rule from now on. If you remember the Mavericks or enjoy playing poker that isn’t Texas Hold ‘Em, why not leave a comment?